Sharing some of my favorite fall accessories. I'm loving the neutral colors for fall. The Tory Burch Smartphone wallet is perfect for moms on the go like me. It's so easy to carry and it holds your phone, credit cards and cash. 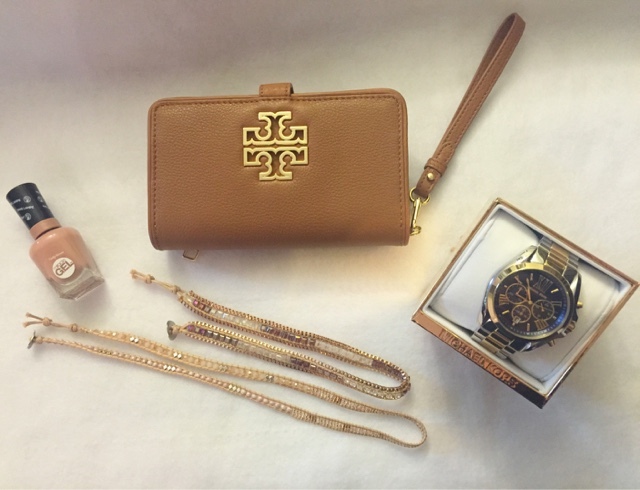 And who doesn't love Tory Burch?!?! This Michael Kors Bradshaw Watch is perfect. The two tone colors makes it easy to wear with anything. It goes great with my gold or silver jewelry. I also love the larger size face too. The beaded wrap bracelets are a fun accessory to wear. The neutral colors makes it wearable with any outfit. I've been loving the Sally Hansen Miracle Gel Polish. It last up to two weeks, which is why I love it. The "Totem-ly Yours" color is a cool neutral tone color. The holiday's are finally here and these items would make great gift ideas as well. Happy shopping!